Despite my having promised more interesting, less opinionated blog posts in the future, a recent post at Marginal Revolution has given me an opportunity to articulate a theory that has been working itself up in my head lately. But first, some pictures. Let's start with the map posted at Marginal Revolution, originally found here. Now that we have a sense of what's been going on, I'll make two points very quickly. 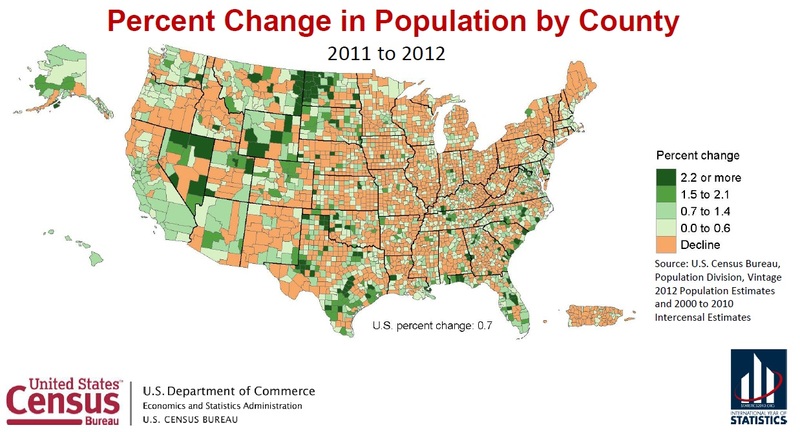 First, if it isn't obvious to you that population growth results in economic growth, I would encourage you to give these maps some additional thought. When people have more children, the economy benefits because, simply stated, people are good for the economy. A tangentially related point to this is that immigration is good for the economy. That's a point for the open borders crowd. Secondly, some have lamented that US median income has been stagnating for years, at least on a national level. Clearly, there is no question that the US has had a poor recovery since the-great-recession-or-whatever-we're-calling-it-these-days. It seems ages ago since it was fresh in our minds, but prior to the "great recession," the big economic issue was outsourcing. People were upset that they were losing their high-paying factory jobs to people in China, and that they were losing their high-paying programming jobs to people in India, and so on. We see technology playing a larger and larger role in daily American life. You can place fast food orders at computers, or online. You will soon receive Amazon.com purchases delivered by drones. Labor is an important component of the economy, and I disagree with Cowen and others when they place such a high emphasis on the importance of artificial intelligence and imagine futures where intelligent robots walk beside us. But when you add up all these trends, it seems to indicate that wages throughout the world are converging. What this means in the United States is that one no longer has to move to New York City in order to enjoy New York City salaries. From the NYC vantage point (or Fairfax, VA), this feels like "stagnation" because it is getting costlier and costlier to keep up with ever-inflating price levels. But, from the vantage point of Oklahoma City or Topeka it looks a lot more like increasing wages. That's because incomes in the Midwest are apparently increasing, and thus converging with comparable incomes in the old urban centers. On an international level, the middle class in the developing world is and has been experiencing enormous wage growth. Life is not as "dire" in developing nations as the Baby Boomers once believed. In fact, life is actually quite pleasant. Every year, things in the "third world" look a little bit more like the "first world." My theory here is that, just as "the Great Stagnation" feels like a stagnation in Baltimore, but feels more like a boom in Fargo, the "slow recovery" that we've experienced here in the United States feels more like "solid growth" in places like Mexico and India. In conclusion, I would like to make the prediction that we should not expect to see a lot of wage growth in the United States for quite a long time. But this does not mean that life will get worse here; life will get better as world incomes grow and the entire world experiences hefty wealth increases. I would expect this to put deflationary price pressure on the United States, and the rest of "the west" more broadly. This will likely put central bankers in a bind, but I think they should not worry about it so much. A rapidly growing economy is a very good thing, of course, but a surge in global wealth and its resulting income convergence is also very good. To fully reap the benefits of what's going on, we here in the United States should think about decreasing barriers to international trade, so that we can more fully enjoy decreasing prices, and also that we might do a better job of doing business internationally.